The direction and quality of the light on the subject are the most important keys to image impact. Light and shadow give emphasis, form, and texture. There are important subtleties in the angle of the light that can be understood by learning about phase angle, incidence angle, and emission angle. This article describes the basics regarding the angle of light. The direction of the light on the subject is important, for example straight overhead sunlight generally produces harsh light with deep shadows in people's eyes and flat appearance to topography (an exception is that some Canyons have the best light when the sun is high). The angle from the light source (e.g. the sun) to the subject and then to the camera is called the phase angle (Figures 1a, 1b, 1c, 2a, and 2b). The angle of incidence of the light source (e.g. the sun) on a subject along with the phase angle sets the shading we view on the subject. But that shading occurs on all scales, from huge mountains, to tiny shadows cast by feathers on a bird. The larger-scale shading is important for showing form. The smaller scale shading is important for showing texture. Phase Angle The angle from the light source to the camera as viewed by the subject. 0 degrees: Front lighting. No shadows. Example: the sun is behind your back (Figure 1a). 45 degrees: Front lighting with small shadows. 90 degrees: side lighting. Example: the sun is to your (left or right) side (Figure 1b). 135 degrees: Side and back lighting, transmitted light from subjects like leaves. 180 degrees: back lighting, transmitted light and diffracted light; can be very bright as with clouds. Example: the sun is shining directly into the camera (Figure 1c). While front, back, and side lighting are the traditional concepts that photographers are taught, the subtleties of phase angle in between the above values are critical to image impact. I will first present some traditional images of front, side and back light and then discuss the importance of phase angles in between these angles. Front Light. Front lighting returns the most light from the subject. The sun is behind the viewer but there are few if any shadows on the subject. As phase angle become low. the subject looks flat and the only contrast is that due to reflectance levels and color. Contrast can be 100:1 and lower. At very low phase angles, color decreases (technically, this is due to a process called coherent backscattering and shadow hiding; examples will be shown below). The lion image in Figure 1a is an example of a front lit scene at low phase angle. Scenes like this at low phase are the easiest for camera meters to set the correct exposure. Figure 1a. 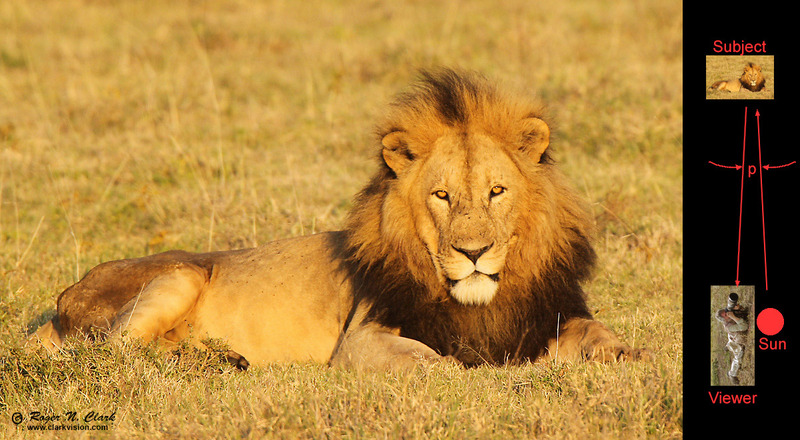 A front lit lion in Tanzania. the sun was almost directly behind me, just slightly over my right shoulder. The phase angle is about 10 degrees. There is only slight shading on the left side of the lion's face. The scene appears mostly flat. Side Light. With side light, the light source (e.g. the sun) is off to your right or left. The phase angle is approximately 90 degrees. The advantage of side light is that for areas on the subject where the light is grazing the surface, texture is enhanced (Figure 1b). The disadvantage of side light is that the shadows can be very dark with contrast of 1000:1 and even 10,000:1 and higher. If you want to record detail in the shadows, as well as the brightest parts of the scene, metering and exposure can be difficult. Sometimes the camera does not have enough dynamic range for the scene. Some photographers mitigate this contrast by using fill flash. Figure 1b. A side lit wild elephant in Tanzania. The side lighting enhances the incredible texture in the elephant's skin, but only where the late afternoon sun is grazing the surface. The phase angle is approximately 80 degrees. 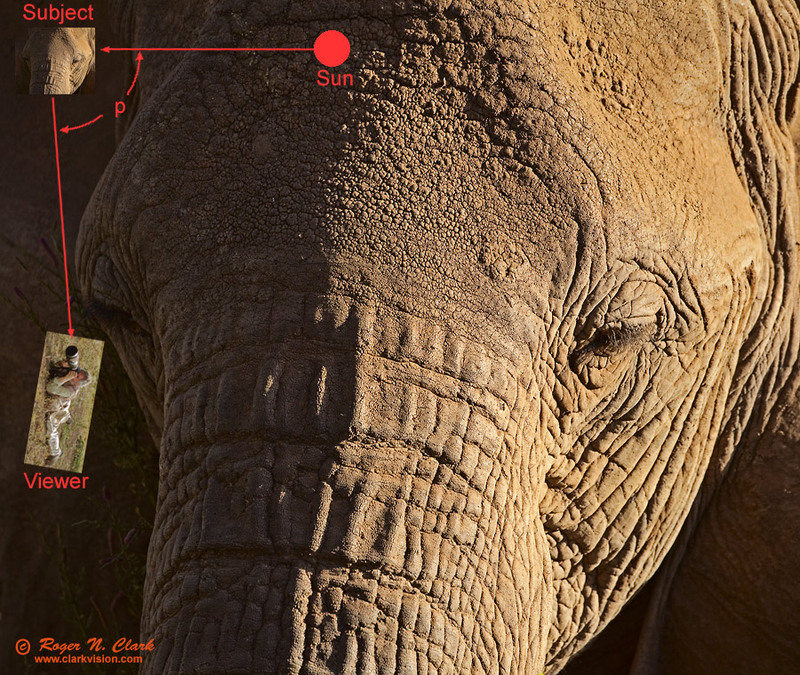 The left side of the elephant's face is in shadow, but the shadow was filled in by light reflected off of bushes to the left (outside the scene). Back Light. Back light puts the subject between the viewer and the light source (the sun). This includes silhouettes, as in Figure 1c, where the sun is in the frame, and other cases where the sun is just out of the frame. Contrast and dynamic range are very high. If the sun is in the frame, contrast can exceed 1,000,000:1. Back lit scenes can produce stunning images, but exposure is difficult and many light meters in cameras do not give an optimum exposure. Figure 1b. A Tawny Eagle at sunrise on the Serengeti, Tanzania. The scene dynamic range is too large for the camera to record detail on both the eagle and on the sun. The phase angle is 180 degrees in the center of the sun, and about 178.5 degrees at the eagle's head. Phase angle is a continuum from zero degrees, front light) to 180 degrees, back light (Figures 2a and 2b). It is often in between zero and 90 degrees phase, or between 90 and 180 degrees phase where images have great impact. Below and in the next parts of this series, I'll explore these other angles and show which angles to avoid in certain conditions. Figure 2a. Phase angle. In this diagram, the subject you are observing is in the center and you are on the circle at different locations around the circle. The light illuminates the subject the same, but you see different proportions of lit and shaded parts of the subject as you move around the circle with angle "p," the phase angle. Phase angles range from zero to 180 degrees. Low phase angles have the light source (e.g. sun) behind your back as you photograph your subject. Phase angles approaching 180 degrees means you are photographing toward the light source. Watch the phases of the moon (Figure 2b). When the Moon is full, the angle between the sun and camera as seen from the subject (the moon) is very low. In other words, the sun is behind you when viewing the full Moon when the Moon is near the horizon. In this case, you see no shadows, thus no landforms. At first and last quarter (the moon's disk is half lit), nice shadows show near the sunrise/sunset line and craters are well defined. This is 90 degrees phase angle and at the sunrise/sunset line the sun's angle of incidence is low (like on the elephant's skin in Figure 1b). It is the same with other subjects: faces show deep shadows (whether human or animal) at 90 degrees phase angle which may not be desirable. Deep shadows may be what you desire for a landscape scene where you want to show the topography of a rugged mountain. Front lighting is often desired for wildlife photography as it often shows the colors and fine structure in fur/feathers. But there are always exceptions. Figure 2b. Lunar phase angles. Phase angles of the Moon as viewed from Earth range from near zero (<2 degrees and the Moon is in the Earth's shadow during a lunar eclipse) to near 180 degrees when a thin crescent (exactly 180 degrees has the moon between the Earth and the Sun during a total solar eclipse). Low phase angles have the light source (e.g. sun) behind your back as you photograph your subject. Phase angles approaching 180 degrees means you are photographing into the light source. Note the changing shadows revealing craters as you move away from near zero phase angle. This same effect occurs with everything we observe and photograph. Why is Phase Angle Important? Photographers have long known about front light, side light, and back light, so why do we need to know about phase angle? There are several factors that the front, side, and back light glosses over. For example, examine the grass field in Figure 3. Note the changes in color and perceived structure around zero degrees phase angle and at higher phase angles. Figure 3. The grassy Serengeti showing the changes in brightness and color as a function of phase angle. At zero degrees is the shadow of my head. Around the zero phase point the grass field is brighter, color is lower and there are no shadows apparent. As phase angle increases, color saturation increases, small shadows are visible and there is more contrast between the grass blades. There is a lot in common between the images in Figures 1a, 1b, 2b, and 3. The lion in Figure 1a, full Moon in Figure 2b and the zero phase area in Figure 3 all show a flat subject without significant contrast in the fine structure. Now compare the elephant in Figure 1b, the side lit Moon in Figure 2B, and the 30 to 40 degree phase area on the grass in Figure 3. There is significant fine structure (the elephant's skin, the small craters on the Moon, the shadows in the grass). The phase angle characteristics of materials, whether rocks and soil, vegetation, animal's fur or skin, or bird feathers show that there are implications to producing images with impact. 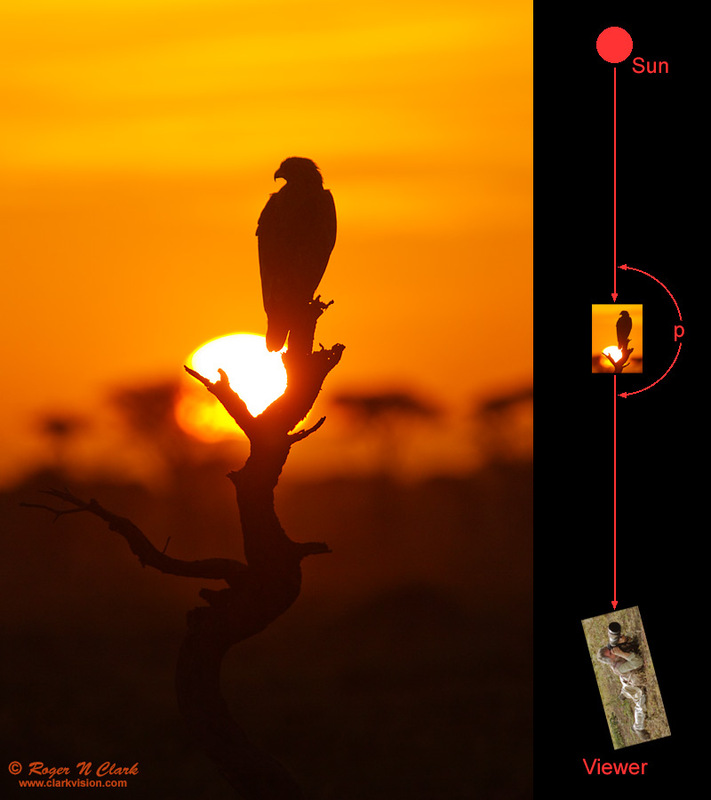 These implications include timing and position of the sun (or other light sources), the subject, and where the photographer positions himself or herself. The general implications include the following. Avoid too low of a phase angle. Low phase angles have lower color and images appear less sharp because there are little to no small shadows that give images texture (micro shading). Low phase angles reduce macro shading which give 3-dimensional subjects form. For front lit subjects, put the sun over one shoulder at least 10 degrees away. Do not point your shadow at the subject, at least when the sun is low. Contrast increases with phase angle, challenging dynamic range of most cameras. But results can be dramatic, enhancing form and texture. Color saturation increases with phase angle on most subjects, and significantly so up to about 10 to 20 degrees. In part 4 I'll describe advanced concepts of phase angle and introduce positive and negative phase angle that has additional implications for micro shading and texture in images. I'll also show the effects of varying phase angles on images of birds.